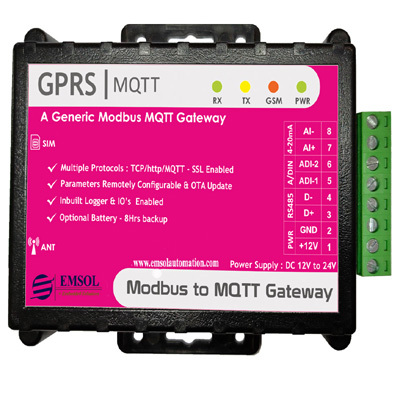 Modbus to GPRS Gateway replaces the wired approach of sending the Modbus slave data to the centralized server, either single or multiple slaves. The device collects the data through MODBUS (RTU) protocol and sends it to the centralized server through GPRS using TCP or Http mode. It’s a generic device to fetch the Standard Modbus Slave device like Energy meters, Solar Inverters, PLC, Windmill, AMR, IO Modules, Flow Meters and more. The built-in smart data redundancy communication paths of GPRS in RTU Gateway, the data would be guaranteed to transfer your centralized server. Intelligent Modbus,IO,Data Logger,GPRS Connectivity Management. LED indicators provide GSM, GPRS, Signal, Modbus status.